This ChimeraX demonstration exploring nuclear pore architecture will highlight recent developments related to Technology Research and Development (TR&D) projects 1 and 2, and two driving biological projects (DBP 1 and 3) and a collaborative project (CSP 1) described in the grant proposal. DBP 1: Integrative modeling, Andrej Sali, UCSF, and Helen Berman, Rutgers University. DBP 3: Data archiving formats and visualization, Steve Burley, RCSB. 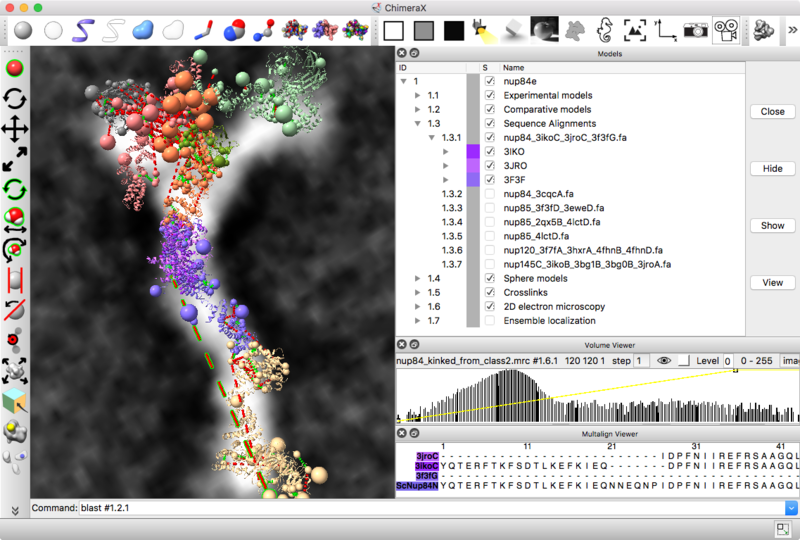 Collaboration 1: Visualizing and analyzing crosslinks, Martin Beck, EMBL Heidelberg. 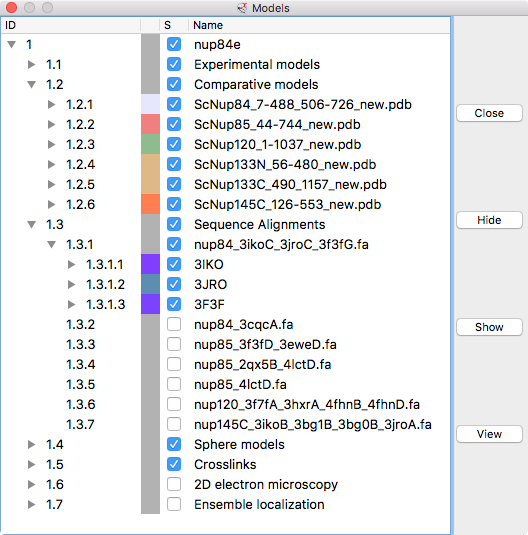 Integrated analysis of diverse data used to build molecular models. 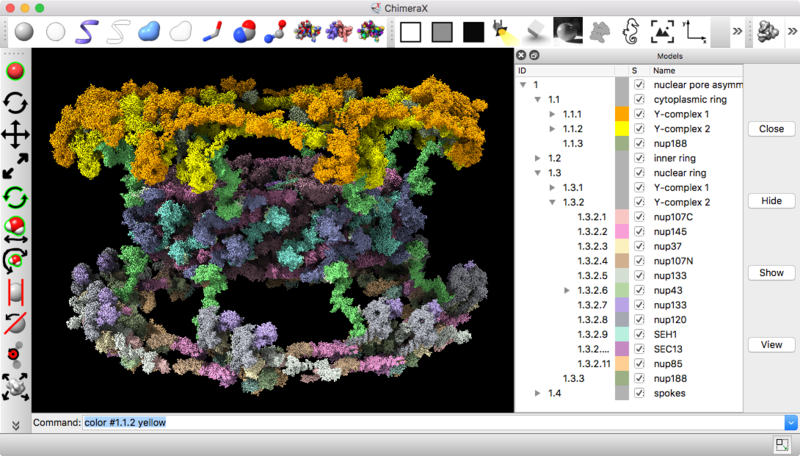 Advanced graphics for visualizing very large molecular models (millions of atom). Interactive 2D plots (histograms, networks, scatter plots...) coupled to 3D graphics for data analysis. Web services combining online database search and computations with desktop analysis. 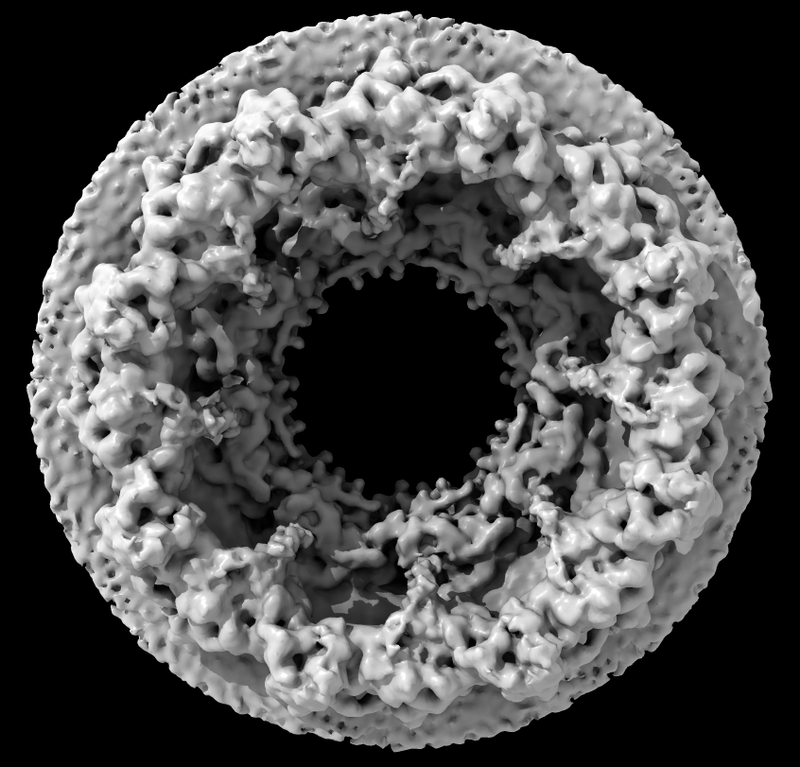 Nuclear pore composed of 30 different types, 1000 copies, 8-fold symmetry. GPU programming allows casting ambient lighting from all directions for better depth perception. 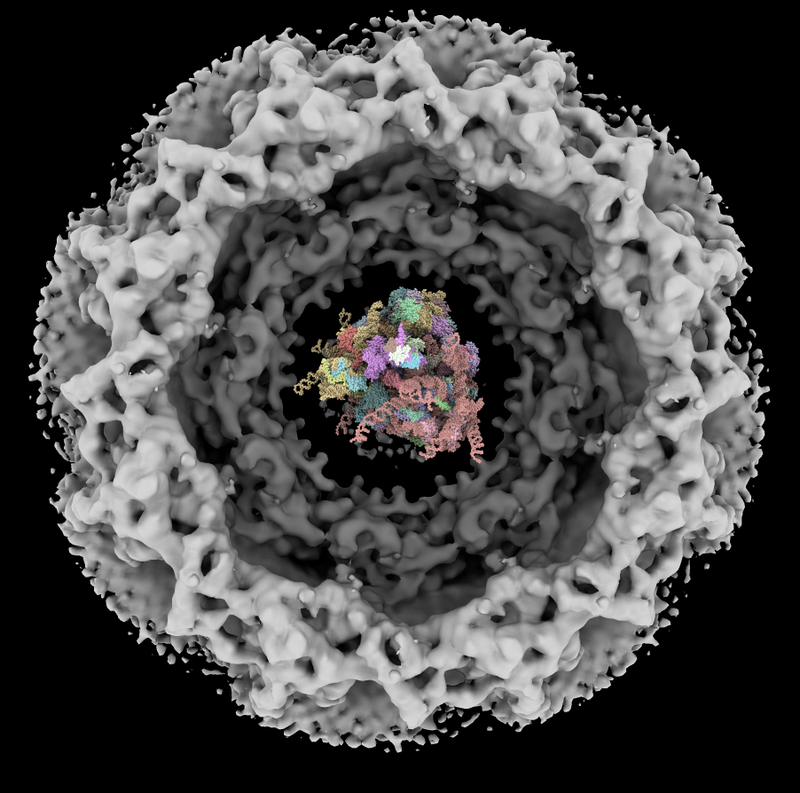 Human nuclear pore EM, 23 Angstroms resolution (Beck lab). Ambient occlusion lighting shadows crevices. Simple lighting used by current generation visualization programs, hard to perceive depth. Ribosome size compared to nuclear pore. 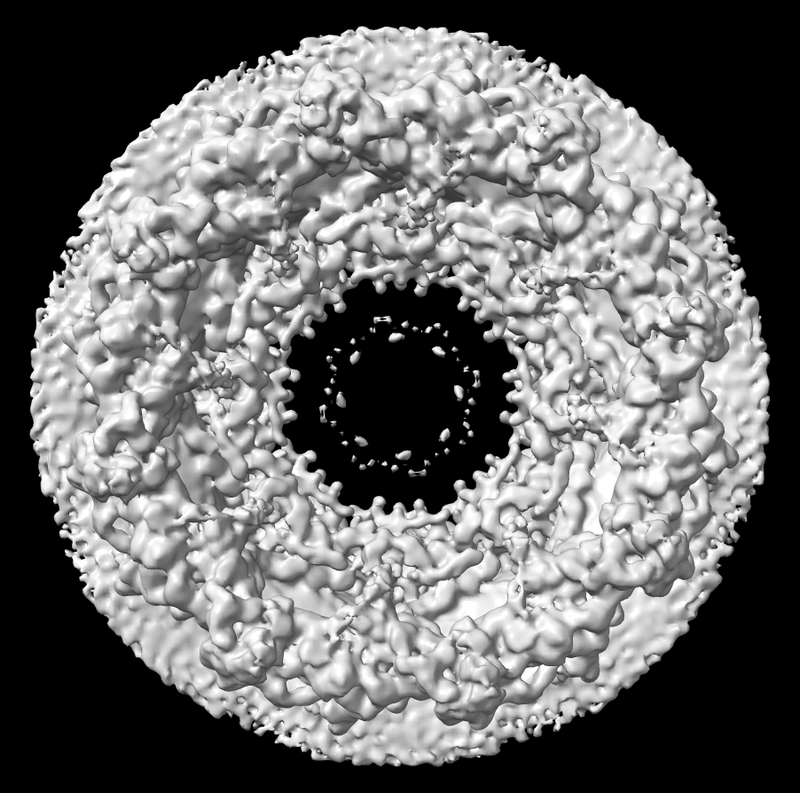 736 copies of 20 proteins, 4 million atoms composing about half the mass of nuclear pore fit to electron microscopy (Hoelz lab, 2016). Hierarchical organization: inner and outer rings, spokes, and Y-complex. 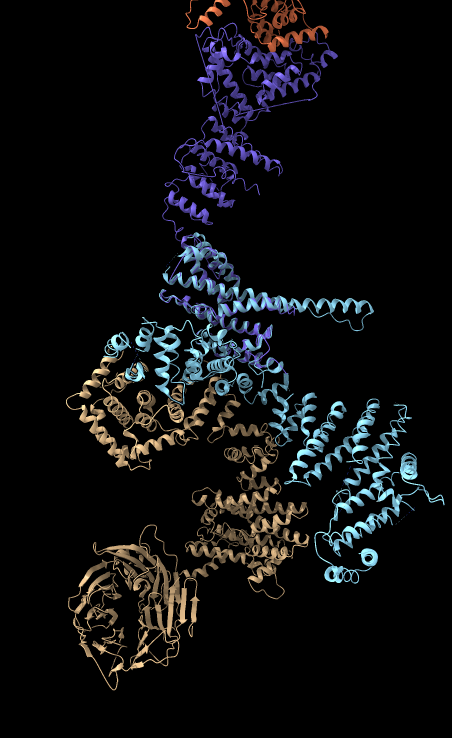 Asymmetric unit has 92 proteins. Copies of Y-complex form scaffold for outer rings. Look in detail at integrative model of Y-complex. 7 protein Y-complex (also called nup84) forms scaffold for nuclear pore outer rings. Coarse grain models, one or more residues per bead. Ensemble of several thousand models, grouped in two clusters. Localization density maps summarize variation in protein localization. Data is saved in an mmCIF Integrated Hybrid Model format being developed in collaboration with RCSB for archiving at PDB. Comparative model quality can be judged from source sequence alignments and templates. Templates can be automatically fetched and aligned based on sequence alignments. 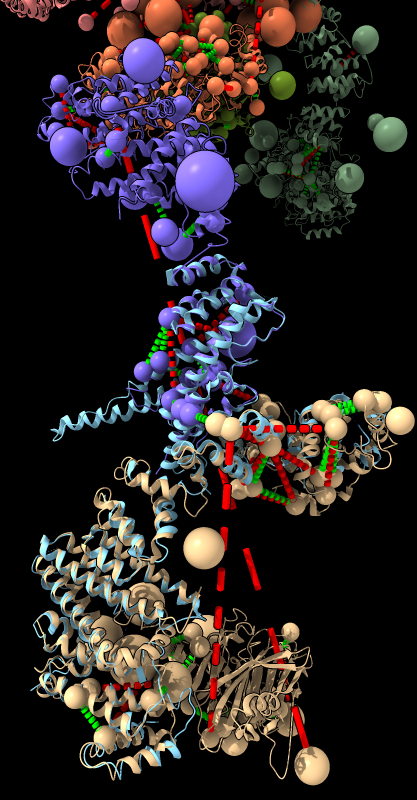 Models from IHM file Template sequence alignments for one protein. Superimposed template models on comparative model. Integrated Modeling Platform (IMP) software (Sali lab) computes ensembles of thousands of models scored based on restraints. 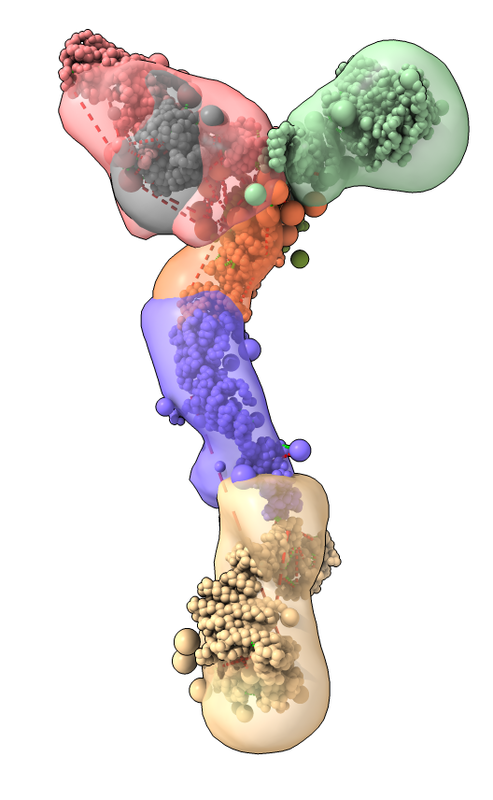 Two clusters for two conformations each of contain 1000 models. Playing ensemble like dynamics trajectory shows variation within ensemble. Localization density maps for each protein in ensemble also shows variability. Look at crosslink restraint satisfaction using interactive 2D plots. Crosslink length plot, mouse over histogram highlights 3D crosslinks. 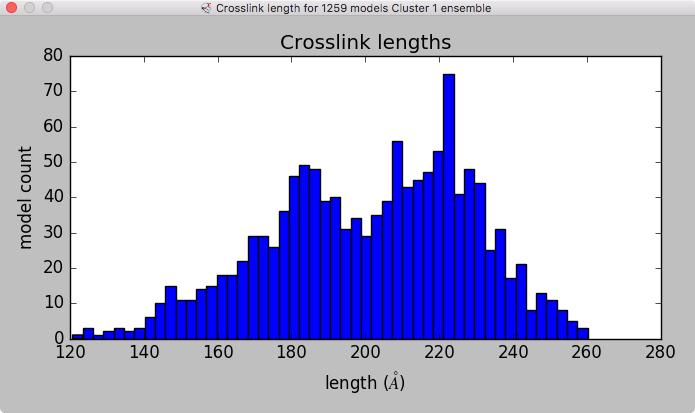 Crosslink ensemble length, mouse over histogram shows associated ensemble structure. Crosslink network shows most crosslinks are intra-protein. 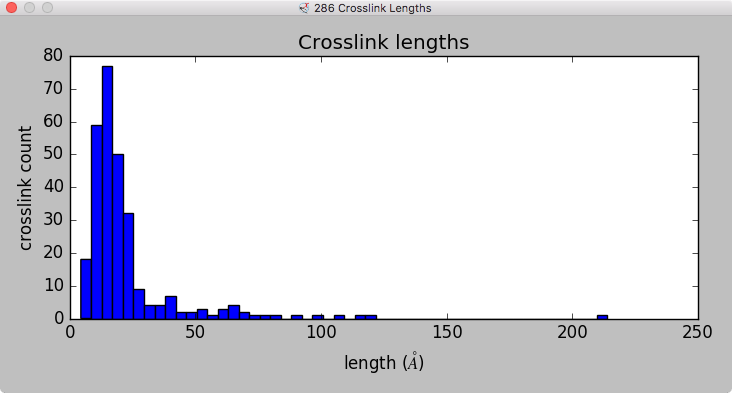 Length of one long crosslink for 1259 ensemble models. Is violated crosslink satisfied in any ensemble model? 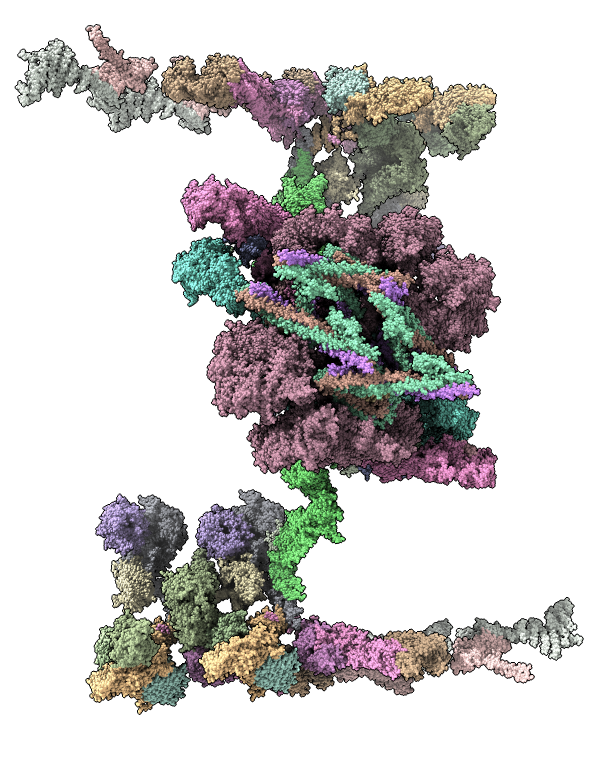 Is the protein interface correct for proteins spanned by very long crosslink? 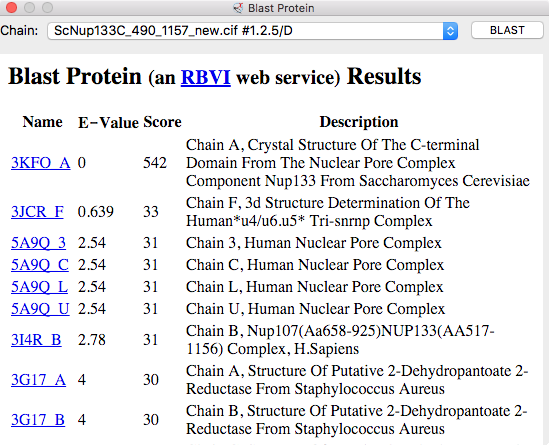 Use BLAST sequence search web service to find an x-ray structure with domains spanning the protein interface. BLAST nup133 (distal protein) sequence against PDB, low cutoff to find distant matches. 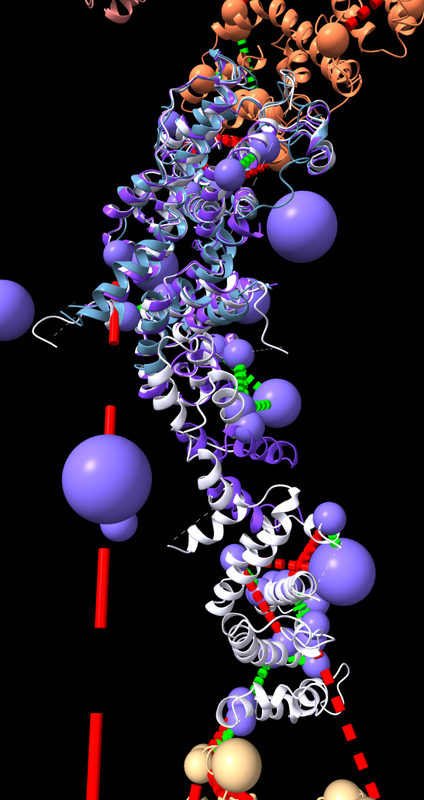 Use PDB 3I4R as a bridge to align proteins nup84 to nup133. Advanced graphics, user interfaces including interactive 2d plots, web services, and unique analysis tools (e.g. secondary-structure guided alignment) enable visualization and analysis of complex molecular structures.